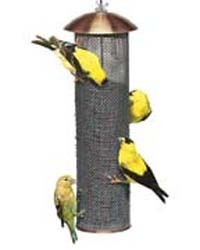 Why are my goldfinches no longer using my feeder? 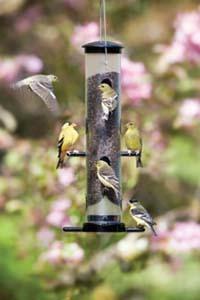 One, or a combination of several variables can cause your goldfinches to slow down or abandon feeding at your feeder. Has your nyjer seed been stored in a hot environment such as a garage or back patio? Nyjer is a very high oil seed, providing lots of fat and protein for your finches. This is the reason the goldfinches are so attracted to nyjer seed. When stored in a hot environment, the natural oil dicapates quickly (within 2 weeks), sometimes becoming rancid. If this happens, the goldfinches no longer have a reason to feed at your feeder and begin finding better options elsewhere. Always store nyjer seed at room temperature. Have there been several days of rain recently? Rain and condensation can cause the nyjer at the bottom of the feeder to quickly mold, making the seed very unappetizing to your birds. This happens frequently during monsoon season and during winter rains. During rainy periods, replace this bottom portion of seed regularly. Is there an accumulation of sticks and debris in the bottom portion of your feeder? Nyjer usually contains a small amount of sticks and debris that will not go through the feeding ports. As you "top off" your feeder each day, this debris accumulates at the bottom of the feeder, blocking the ports and cutting off access to the seeds. About every 2 weeks, dump the bottom quarter of the finch feeder and start fresh. Are you still using the same bag of nyjer that was purchased many months ago? Fresh birdfood is the best birdfood. Generally, we recommend using any bag of birdseed within 4 to 6 weeks after purchase. This is when the seed is freshest and contains the most fat, protein and other nutrients that are so beneficial and attractive to your birds. Also important is utilizing a retailer that turns over it's inventory at a rapid rate. Home > Frequently Asked Questions > Why Aren't My Goldfinches Feeding?